Charles Barker raises to 100,000 and James Moore calls. 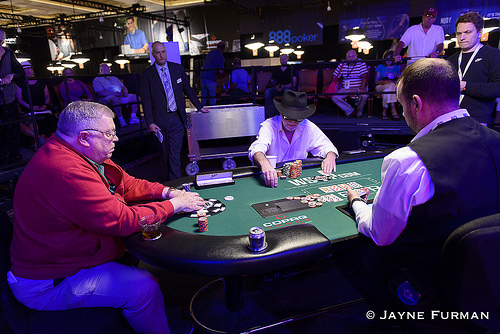 The flop is and both players check. The turn is the and Moore checks. Barker bets 300,000 and Moore raises to 700,000. Barker then goes all in and Moore calls. Moore has the better flush with the and just beats Barker who holds . The river plays in both flushes but can't change the outcome. Moore wins the tournament and his first WSOP gold bracelet. The two players shake hands and both compliment each other on a well player tournament. "You're a really good player," says Moore, "I got really lucky." "You're a damn good player yourself," Barker responds. Moore takes home $230,626 and the gold bracelet, and he becomes the 2016 Super Seniors Champion.